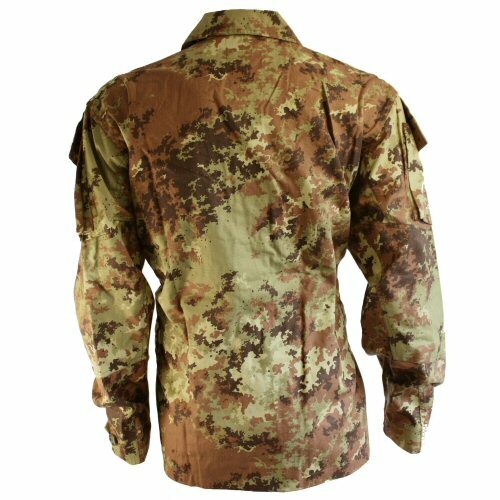 Unissued genuine Italian Army combat shirt in Vegetato camouflage. 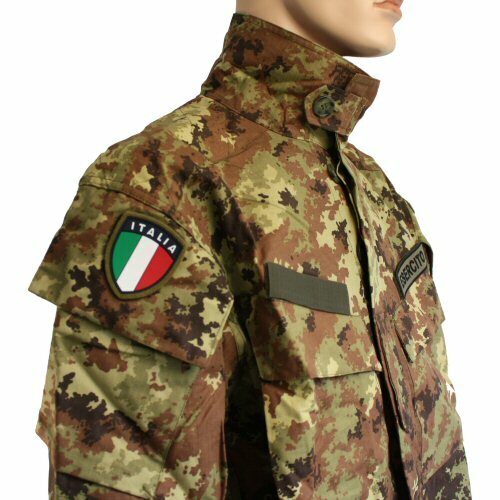 The Italian Army combat shirt is made from lightweight cotton-poly ripstop fabric and features reinforces shoulders, large upper arm pockets, two slated chest pockets, hidden button front, commando style rank tab on front, elbow reinforcement patches, internal button-down gathers at the waist on left and right, traditional collar with button-over tab on underside of the collar, coat hook, velcro name tape patches over each chest pocket, two stage button cuff. 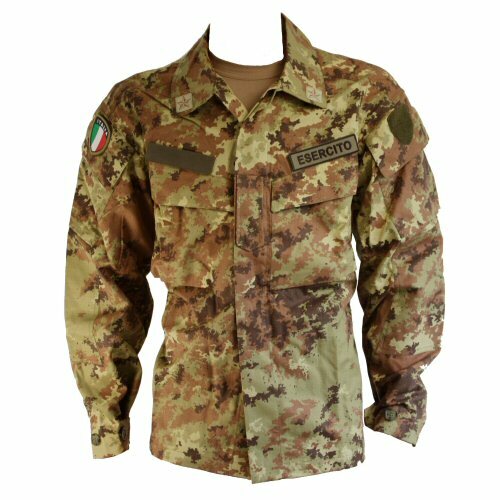 Most shirts come with removable 'Esercito' or Army patch on the left chest velcro and a polymer full colour velcro 'Italia' patch on the right sleeve (patch availablility not guaranteed). The collar also has one subdued stitched on star patch on left and right. 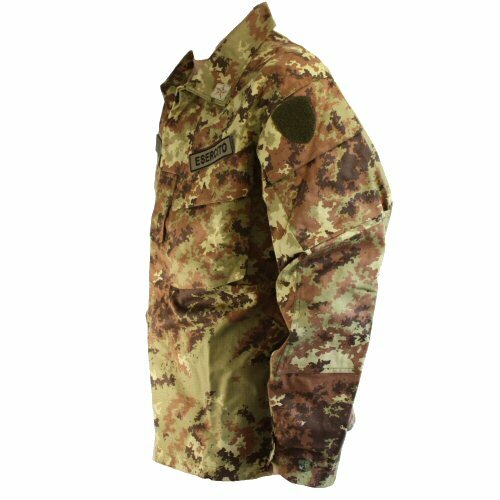 Internal seams are constructed with double overlock felled stitching throughout. Underarms are left open for ventilation. Wide sleeve cuffs are easy to fold up neatly. Original Italian military labels have been removed. Sizes 100cm chest (39in), 104cm chest (42in), 112cm chest (44in) and 120cm chest (48in). 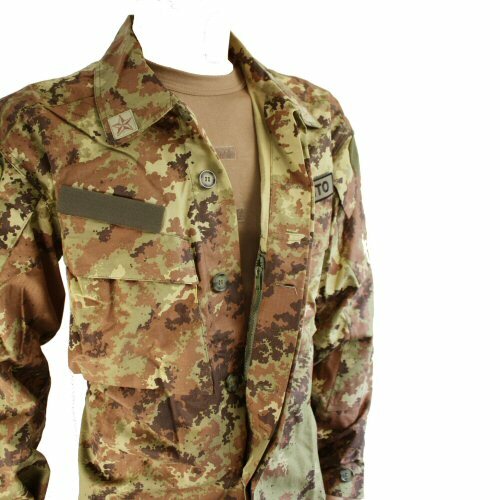 Vegetato camouflage is mimics semi-arid, heath and grassland very well with the four colour blend of tan, olive-khaki, light brown and dark brown. Available options are: 100 , 104 , 112 , 120 . The button front. There is a zip-up internal pocket in the shirt left side. The underarms are left open for ventilation. The collar shown upright, with the tab and button across to hold it in place. 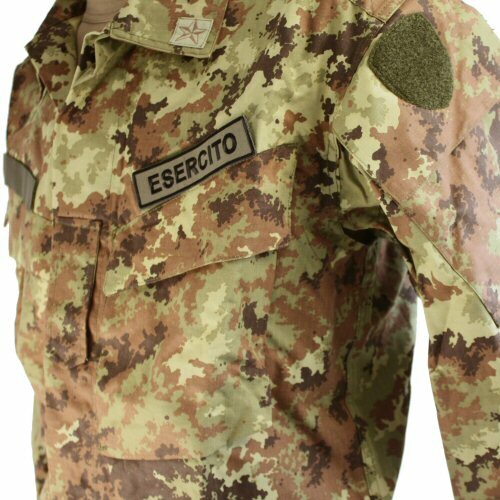 The velcro badgets 'Esercito' and 'Italia' are removable.